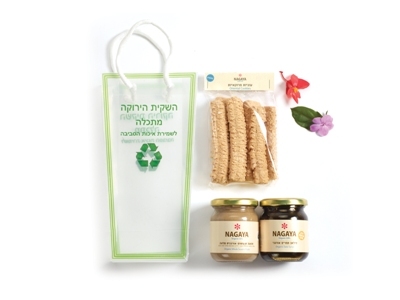 Enter into the festive new year spirit with a unique Rosh Hashanah kosher basket which is also incredibly ecologically friendly. Rosh Hashanah is traditionally a time for spiritual renewal, but this kosher gift basket goes one step further by making sure that your new year also encourages ecological renewal. It is presented in a transparent ecologically friendly bag and includes a variety of organic treats. These include fully organic sesame butter and pure bees’ honey, beautifully presented in separate attractive pots. They are complimented by a bag of sweet hand-made Moroccan style cookies or a similar collection of original baklava delights from Nazareth. This unique package will make for a special Rosh Hashanah gift basket for both friends and family.